Give your child a head start to life and learning at the Stamford American Early Learning Village. Specially designed for the preschool years, our Village welcomes children aged 2 months to 6 years. Inspired by the Reggio Emilia approach, the Early Learning Village has been built as an environment for safe, experiential learning. Natural wood structures and open spaces give children the freedom to explore and discover, and to express themselves. Babies and toddlers aged 2 to 18 months enjoy an extra special level of care at our Infant Care Program. Your little one will have lots of opportunity for growth and learning in a secure and comfortable space under the thoughtful supervision of our experienced carers and educators. Contact our admissions team to learn more about our 2-, 3- and 5-day Infant Care Programs. 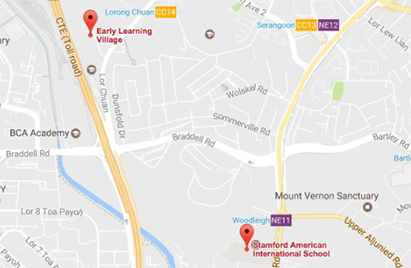 The Early Learning Village is just minutes away from the Elementary & Secondary Campus, and offers a first-class international program to all children of preschool age. If you are a Singaporean parent interested in our preschool program, get in touch to find out how you can use your Child Development Account (CDA) towards tuition fees.